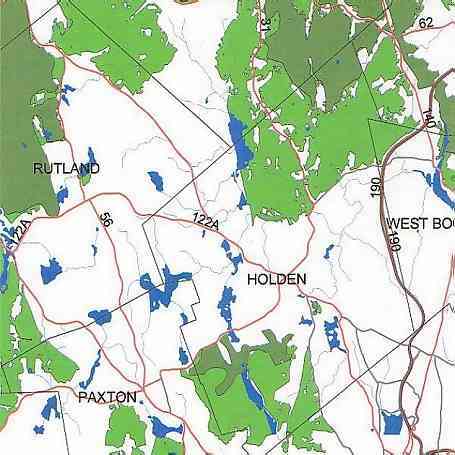 For some years Natural Heritage, a State agency, has been mapping the habitats of all wildlife that can be found in Massachusetts. From the maps of individual species they have determined areas that are important for the maintenance of wildlife, and which if developed further would probably lead to significant loss of biodiversity. The core habitats (in dark green) are areas which contain the habitats of rare plants and animals, and are viable communities, deserving the highest degree of protection. The lighter green areas depict supporting natural landscape, which is almost as important as core habitat, providing support for species in the core and acting both as links between core habitats and as buffer zones. Blue shows lakes, ponds and streams. Holden, Rutland and adjacent towns all contain areas of great importance to wildlife. 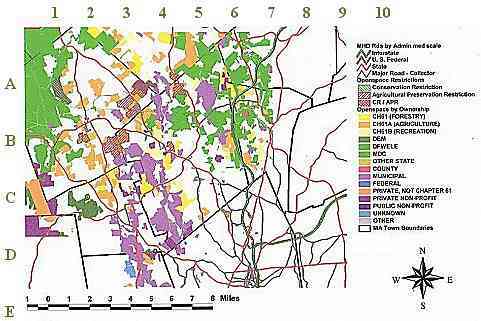 Wildlife Habitat map data is from data by MASS GIS and Natural Heritage. Holden is the diamond shaped outline in the center. The mauve areas (municipal in the key) are mostly owned by the Worcester Water Authority, as catchments for the reservoirs. Most of the green is owned by the MDC (Metropolitan District Commission). Only the White Oak land off North Street shows on this map, as purple (private non-profit).